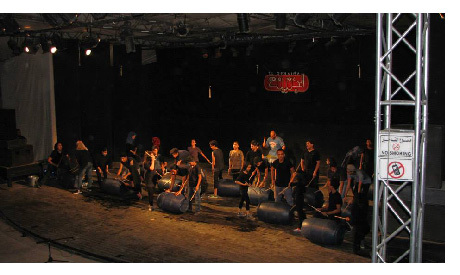 Led by trainers from Stomp UK, students from the Al-Darb Al-Ahmar Arts School participated in a two-week workshop that culminates in the performance of their own Stomp version on 5 and 6 February at Faliki Theatre. Originating in Brighton, UK Stomp is a percussion group known for using ordinary objects, movements and physical comedy on stage. Al-Darb Al-Ahmar Arts School was founded in 2011 by Al-Mawred Al-Thaqafy (Culture Resource) with support from the Aga Khan Trust for Culture and Al-Fanar Foundation. It aims to teach circus arts and music to students ranging from ages 8 to 16. The school also provides health and social care to its students.